PALO ALTO, Calif. - Burglars drove a stolen SUV through the front of a Bloomingdale's store in Palo Alto Wednesday morning and stole what police called a "large amount" of jewelry, reports CBS San Francisco. 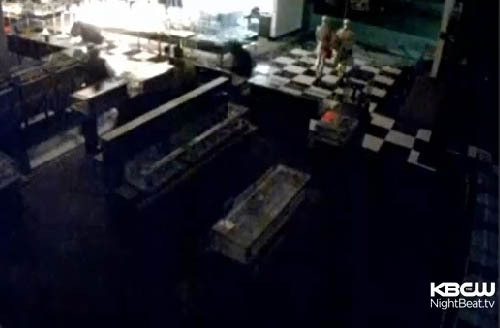 According to the police, Palo Alto police said when security guards arrived at the scene they found the front glass doors had been completely smashed and several glass display cases just inside the store were shattered with the jewelry missing, reports the station. Surveillance footage showed a red SUV backing into and smashing the glass doors, followed by three suspects on foot entering the department store. It only takes one minute from the moment the suspects walk in to the moment they exit to the waiting SUV. Investigators said no specific descriptions of the suspects were available, and their race and gender were not discernible from the surveillance images, reports the station. There was no immediate word on the dollar amount of the loss.